The Ship of Fools Pool could use some sportier variations, like naming the day a satellite first spots a blue water lead extending to within 1000 km of the pole. Trick question. It won't make a new record this year. I predict another 2 years before it beats 2007. I engaged with Steve goddard to make a bet on a record low minimum this year. based on his posting, which strongly indicate it is all but impossible. I suggested 50:1 odds with me betting $10. He INSISTS on straight odds, and got rather testy with me when i suggested that meant he thought there was an even chance of breaking the record. I offered to pay upfront, since I "couldn't posssibly win", and then also offered the same bet for the Houston Astros winning the World Series. For a moment I thought he might go for it and one of his supporters actually told him too. I actually feel a little sorry for him if it DOES break the record. He takes this being right and ALL the alarmists are wrong so seriously. But I am sure he will figure out a way to come out of it thinking he smells like a rose. I told him, i personally don't think there will be a new record this year, but I certainly won't be surprised if there is. Don't know if it will set a new record or not (does anyone? ), but I'll have a go. The day of the minimum for the year: Thursday. This is very difficult. On the one hand we see extent and area keep going down at the same rate, whereas the current weather patterns say they should slow down. 2011 showed that 2007 weather conditions weren't a pre-requisite for equaling or breaking the record. On the other hand I'm still not sure whether the ice on the Pacific side of the Arctic could be enough of a barrier (combined with low SSTs) to prevent massive melting on that side. That could throw a spanner in the works (like it did in 2010 and 2011). BTW, professor Rabett, when you say minimum, do you mean extent or area? And which data set? As we saw last year, there are differences. Some had new records (CT area, UB extent), but others didn't (IJIS extent, NSIDC extent, DMI extent). Anyway, CT sea ice area anomaly has gone below the 2 million square km mark 5 weeks earlier than ever before in the record. I'd bet $10 on a new record at ~10-1. The trend seems to me to be flattening, and at this point 2007 was just getting ready to drop off the cliff. And a denier insisting on even money? That's confidence like Grandma used to make. Since the denialists are so confident that the sea ice is recovering or whatever, I proposed a more statistically boring wager. Starting in 2013, for every year that Arctic sea ice exceeds the 1979-2000 average in any one of the three major metrics (volume, extent, area), I pay you $100. For every year it's below the average, you pay me $50. If there's no long-term downward trend then I should wind up paying you more than you pay me, since we'll be paying out about the same number of times but I'll be losing twice as much money each time. The CT SIA 2011 record will be broken on August 17th (last data 2.986 million km2 is for August 14th in my spreadsheet). The minimum will be reached September 8th. I'm not doing IJIS SIE because of WindSat. For CT area, I'll go for 4 days after the 2.986 (which I think is 13th Aug 2012). I'll say Sept 7th for the area minimum. But what is the point of the weather betting? Shouldn't betting on 2013 and 2014 minimums (or 13, 14 and 15 or longer average) be more appropriate? Crandles, this is a blog, with an ephemeral rating of 20/15. Here today, gone tomorrow. Other the facts you are perfectly correct. Suppose I missed out predicting 24 August and it should be easier to predict the minimum ? I predict that the "initial" minimum will be a bit delayed around 21 September or even later. The winner gets some Qdos and then like the Olympics, gets their medal withdrawn after all the mahem breaks loose and humanity will be so busy coping, that nobody will care about minima or even blogging about it. All good for the world cause as we say in Aus: "To much vermin in the paddock, needs a good spray". 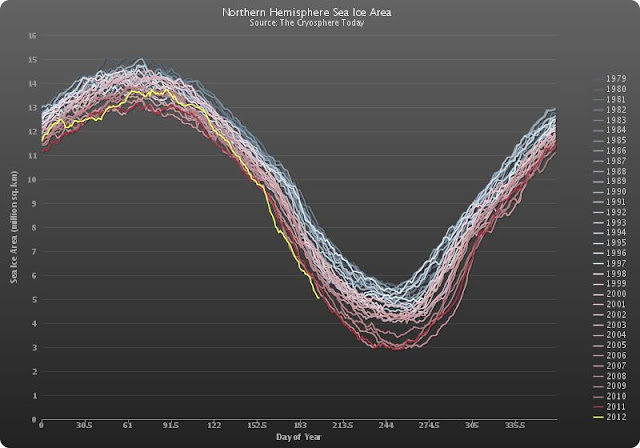 Eli, please fix the url Arctic SIE Sea_Ice_Extent_L.png so that it shows the relevant graph of the day. Now that all Steve's crutches have been kicked away from him, this url is worth another look.